Naples, Museo Nazionale di Capodimonte, no. Q 112. In spite of its apparently unfinished state and abraded condition the picture has a tonal unity of darkness from which emerge highlighted areas very much recalling Rosso’s pictures from the time of the Sposalizio of 1523 on. The portrait seems to be painted on a dark ground like the Christ in Glory (P.20). Close observation of the background and of the whole right edge of the picture reveals the following details: a tapestry, showing two men on horseback with a lance(?) and a horn, hangs on the back wall and appears to be draped to the right of the door; part of this tapestry can be seen between the sitter’s body and left arm and below this arm as well. The style of the tapestry indicates that it is Flemish and of the late fifteenth or early sixteenth century. Just above the sitter’s left shoulder and in front of the tapestry is a small picture of the Madonna and Child with apparently undecorated open shutters (see Molajoli, 1959 below). There appear to be striations on the drapery of the Virgin in this painting suggesting that it is Byzantine. However, the shoulder of the sitter blocks from view whatever this small tabernacle is standing on. At the upper right is the dark maroon and gray-green striped canopy of a bed with a finial at the corner of a “gold” pomegranate split open to show dark red seeds. Immediately to the right of the Madonna and Child a narrow strip of this canopy hangs down and is again visible beneath the sitter’s left arm to the right of the tapestry. To the right of the figure’s left arm there is an oblique view into a bed showing a few white pillows. The rug on the table goes to the right edge of the picture where it is unfinished and dark. Here the sitter’s rumpled garment hangs over the table. What cannot be read is what appears above this corner (more bed clothes?). At the left of the rug the frame of the door in the background can be seen at the very bottom of the picture between the sitter’s legs. Through the door is visible what appears to be another canopy hanging above rumpled drapery. The sitter’s face is very pale with slightly pink cheeks and chin; his lips are fairly bright red orange. His collar and shirt front are white. His jacket is brownish but there are indications that it would have been finished as gray with suggestions of blue and pink. His sash is brown. The tapestry shows very subdued tones of wine red, green, and orange-brown. At the left the architecture and herm are brick red. The canopy beyond the door is dark blue green; the rumpled drapery is dark orange-red. The rug is very light blue with red, orange-brown, white, and small areas of yellow tan. The last part of this description indicates that the picture had already c. 1680 been repainted to appear as it did prior to the cleaning of 1957. Ciardi and Mugnaini, 1991, 120, stated that the Emilian provenance of the portrait is also attested by two seals on the back of the panel with the Farnese arms, one in brown wax, the other on paper. It is possible that the portrait is the following picture mentioned in the inventory of the possessions of Fulvio Orsini made before he died on 14 June 1600: “Quadro corniciato di noce, col ritratto d’una giouane che siede sopra una tavola, del Rosso ­­­­_____24 [scudi]” (Nolhac, 1884, 431). 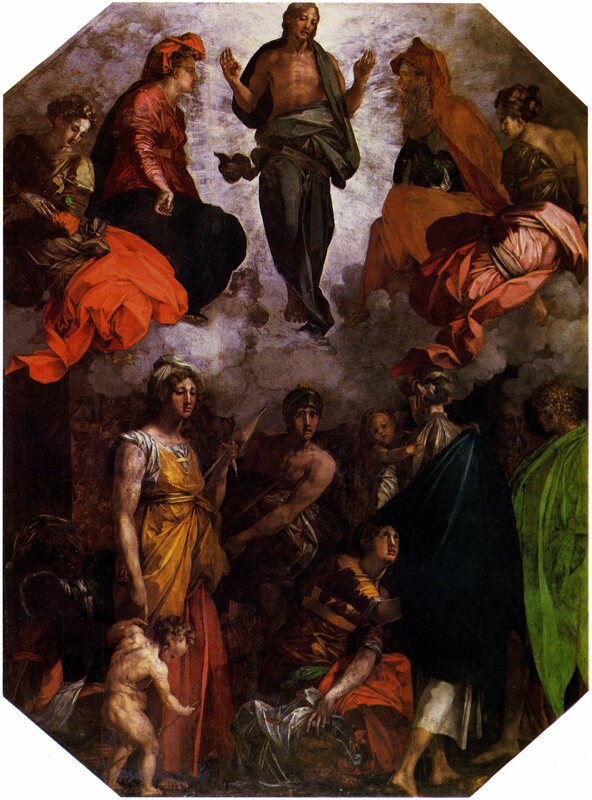 Fulvio Orsini’s collection of pictures in Rome was left to his uncle Cardinal Odoardo Farnese and eventually became part of the Farnese Collection, first in Rome and then in Parma, that finally passed to the Naples museum. Fulvio was also the secretary and nephew of Cardinal Ranuccio Farnese. 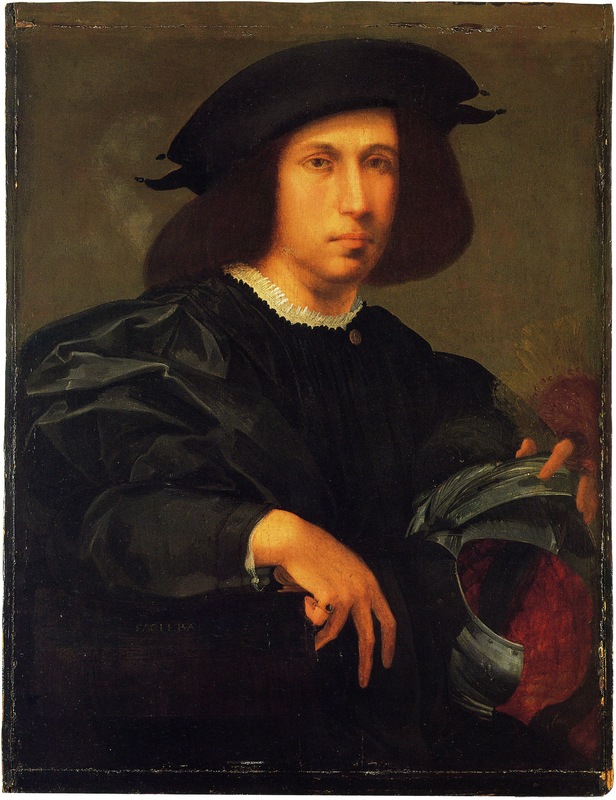 The Orsini inventory states that the sitter is “una giouane,” while the Naples portrait shows a young man. Assuming that in its publication by Nolhac “una” is not a faulty transcription from the manuscript inventory, which is itself a copy, it does seem strange that a young woman in a portrait of the sixteenth century would be shown seated upon a table (“siede sopra una tavola”). It is even unusual to show a man in such a pose, and, in fact, it may be unprecedented in the Naples portrait. But a young woman so informally posed is most unlikely. 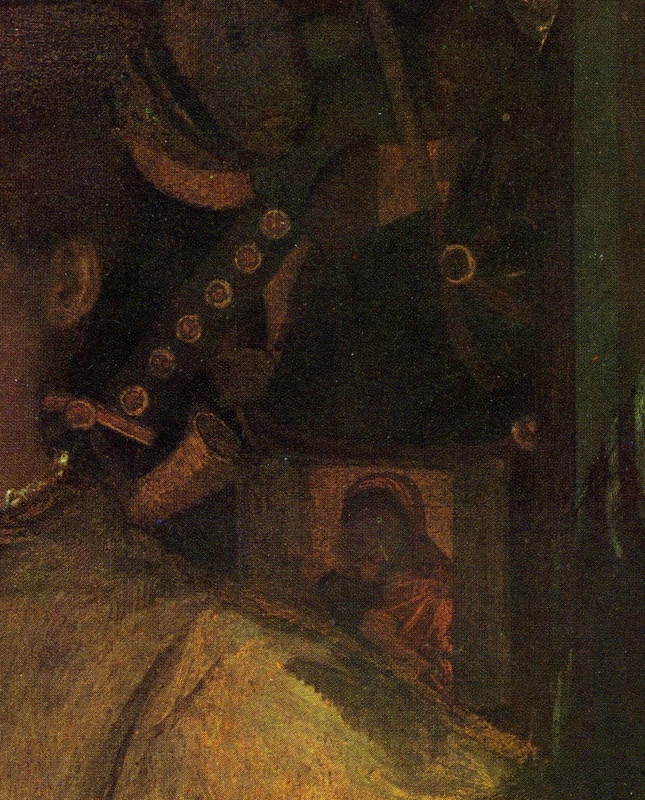 It is therefore possible that the word “una” is a mistake in the copy of the manuscript of the inventory and hence that the portrait in Naples is the one by Rosso mentioned in the inventory of Fulvio Orsini’s possessions at the end of the sixteenth century. 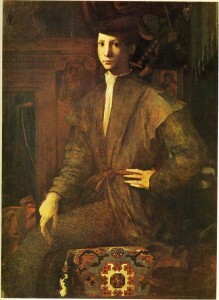 De Rinaldis, Aldo, Pinacoteca del Museo Nazionale di Napoli, Naples, 1911, 279-280, as Parmigianino. De Rinaldis, Aldo, [same title, place], 1928, 223, as Parmigianino. Before the portrait was cleaned its traditional attribution to Parmigianino was accepted by Fröhlich-Bum, 1921, 38; Venturi, IX, 2, 1926, 684, 686, Fig. 557. 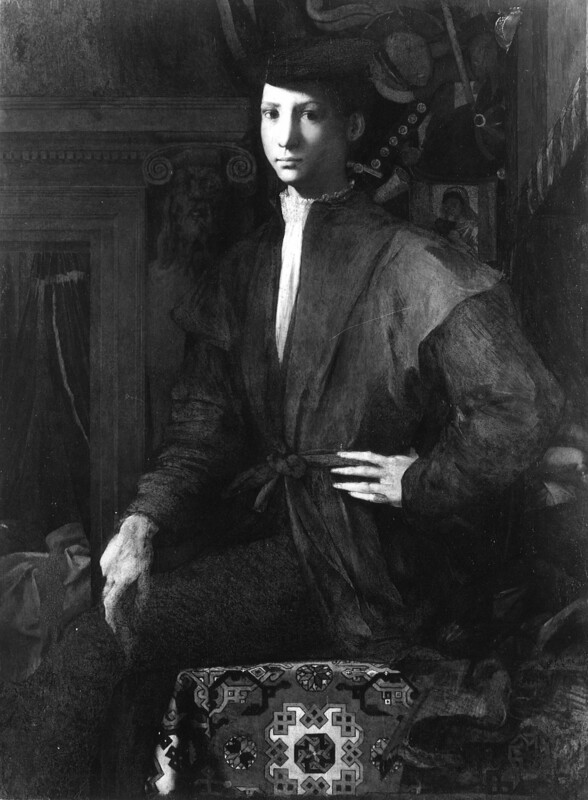 Giovanni Copertini, Il Parmigianino, Parma, 1932, I, 203. Roberto Longhi, “Ampliamenti nell’officina ferrarese,” Supplement to La Critica d’Arte, IV, 1940, 37, n. 2, comments that “tocca al Rosso Fiorentino”; this was before the picture was cleaned. Carlo Gamba, “Centenari: Il Parmigianino,” Emporium, Sept., 1940, 118, as justly taken from Parmigianino and given to Rosso. Becherucci, 1944, 28, as Rosso around 1523. Quintavalle, 1948, 203, as Rosso. Freedberg, 1950, 230, as not altogether improbably by Rosso. Barocchi, 1950, 55-56, 246, as Rosso around 1523. Hartt, 1952, 64-65, as possibly by Rosso. Bologna and Causa, 1952, 5, no. 4, as Rosso (by this time the upper right corner of the picture had been cleaned revealing the pomegranate and the striped material beneath it). Baldini, in Mostra del Pontormo, 1956, 135-136, no. 168, as Rosso, around 1523. Sanminiatelli, 1956, 241, as Rosso, late in his Roman period. Shearman, 1957, II, 215, no. 7, as not convincingly Florentine, nor by Rosso. Molajoli, 1958, 23, 39, Fig. 27, as Rosso, and as restored in 1957. Barocchi, 1958, 238, as Rosso, from his Roman or Aretine period [1528-1529], the latter suggestion because of its similarity to the picture in Città di Castello. IV Mostra di Restauri, exh. cat., Naples, 1960, 57-58, no. 16, Pls. 70-71, gives an account of its restoration by Leonetto Tintori in 1957. Molajoli, 1961, 41, Fig. 16, as by Rosso. John Shearman, “Bronzino,” (review of Andrea Emiliani, Il Bronzino), BM, CV, 1963, 415, as Rosso, around 1525, and the basis of Bronzino’s Ugolino Martelli. Carroll, 1964 (1976), I, Bk. I, 203, Bk. II, 140-144, P. 22, II, Bk. III, Fig. 90, as done in Arezzo in 1529. Borea, 1965, Color Pl. XVI, as Rosso, and as perhaps a portrait of Parmigianino, to whom Rosso was close in Rome. Freedberg, 1966, 583, Pl. 76, as done around 1528. Carroll, 1966, 169, as Rosso around 1529. Shearman, 1966, 171, n. 35, as Rosso in his Roman period. Smyth, 1971, 4, 80, as a remote ancestor of Bronzino’s Chatworth drawing for his Man with a Lute in the Uffizi. Béguin, in EdF, 1972, 175, as Rosso around 1522-1523. Mills, 1978, 27, Fig. 26, shows a “small pattern Holbein” carpet. Luciano Bellosi, in Primato del disegno, 1980, 42, as Rosso. Le collezioni del Museo di Capodimonte, Milan, 1982, 55, as Rosso. 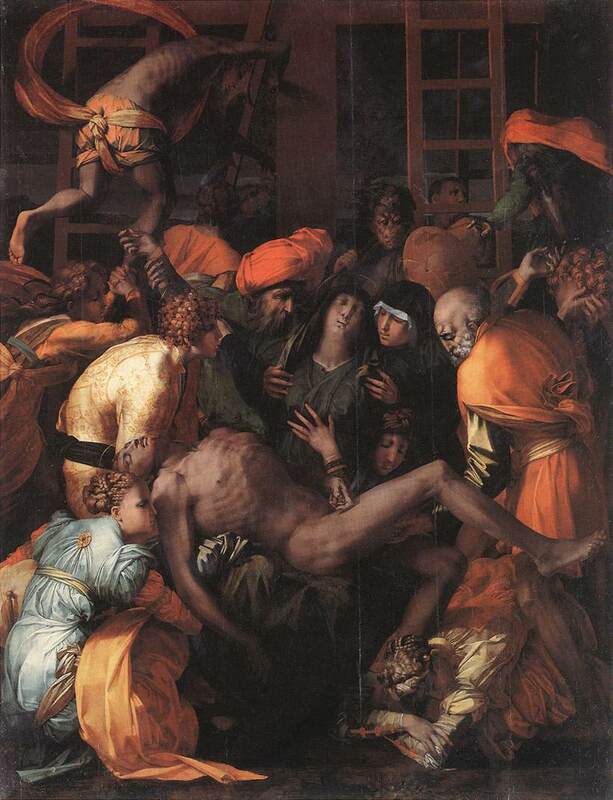 Fomez, 1982, with Figs., as Rosso, and done in France between 1537 and 1540, around the same time as the Louvre Pietà. Darragon, 1983, 75, Fig. 57, as around 1529. Berenson, 1983, 195, Pl. 1464. Wilmes, 1985, 153, 154-159, Fig. 34, as Rosso’s latest portrait, done in Rome. Bertini, 1987, 183, no. 283, Color Pl., 215, as Rosso, no. 330 (Titian), 246, no. 244 (Parmigianino). Carroll, 1987, 175, n. 8, under 57, as by Rosso and most similar to his Mars and Venus drawing of 1530 [D.42] and hence probably of the same time and also done in Venice. Ciardi and Mugnaini, 1991, 18, 26, 116, 120-123, with 2 Color Pls. Philippe Costamagna, “Francesco Salviati (1510-1563), peintre et dessinateur: une nouvelle attribution pour le Luthiste du museé Jacquemart-André,” Revue du Louvre, 5-6, 1991, 34, and n. 27, Fig. 9, as by Rosso and painted in Rome. Franklin, 1994, 138, 212, 215-216, 224-227, Color Pl. 177, as done in Rome and not necessarily unfinished, the latest of Rosso’s portraits, with parallels in the Portrait of a Man in Vienna that he attributes to Parmigianino, and as perhaps belonging to the category of portraits of handsome young men, a popular sub-genre of the period. Marchetti Letta, 1994, 77, Pl. 103, as generally considered his latest portrait, dated in Rome and in 1529. Haitovsky, 1994, 119, wrongly as in Washington, the mask above the “fireplace” as standing for old age in contrast to the youth portrayed. Ciardi, 1994, 70, 71, notes gothic aspects in the tapestry and the “antica” image of the Madonna and Child. One cannot, however, overlook the possibility that the portrait was done in France. The appearance of the Flemish tapestry in Rosso’s painting could indicate that it was executed outside Italy. In its elegance the portrait bears a certain resemblance to Rosso’s Judith of 1530-1531, known from Boyvin’s engraving (E.7). A richly composed interior is also found in Rosso’s Annunciation of 1531 or 1532 in the Albertina (D.43), and the elaborate architectural setting, though not an interior one, of his Narcissus of the same date (D.44) might also lead one to see the portrait as from Rosso’s early years in France. The Raphaelesque Portrait of Giovanna d’Aracona in the Louvre that Francis I owned could just possibly have influenced Rosso to give his portrait its rich interior background, although Lotto’s art, that Rosso could have seen in Venice just before he left for France, provides a closer model. One could not insist upon a French date for the portrait in Naples, but one should not rule it out altogether as a possibility. Two other factors might eventually have some meaning in determining a more precise date for the portrait: its possibly unfinished state and its possible provenance. Rosso’s flight from Rome could be considered as a cause of its incompleteness as this sudden departure seems also to have left incomplete Caraglio’s engraving of Rosso’s Battle of the Romans and the Sabines (E.48). But the style of the portrait does not support a Roman date. Due to illness he suddenly left Città di Castello in 1528. Rosso also fled from Arezzo in 1529, leaving the S. Maria delle Lagrime project incomplete, as well as from Borgo Sansepolcro in 1530. He was briefly in Pesaro on his way to Venice. His departure from Venice in 1530 was also possibly rather sudden once he was summoned to France by Francis I. The portrait would not seem to be a very late work so it is unlikely that it was left incomplete by Rosso’s possibly sudden death in 1540, although Fomez in 1982 thought it was done in the last years of his life, around the time of the Louvre Pietà. One could, however, imagine circumstances in France not allowing him to finish this portrait at an earlier date, especially if it was not a royal commission, which nothing about it suggests. Given his comings and goings in Italy between 1527 and 1530 an unfinished portrait in these years would not be unlikely. Nor in France if it was begun in the first year or two of his stay there and then abandoned when he became busy at Fontainebleau. If the portrait was owned by Fulvio Orsini one might expect that it was of an Orsini and inherited from someone in the family. This could suggest a Roman origin, but again stylistically this does not seem likely. However, the Orsini served both the Venetian Republic and the King of France. A relative of the Orsini without the Orsini name is also possible, perhaps someone with a coat-of-arms that corresponds to the dark maroon and gray-green stripes and the pomegranate in the upper right corner of the picture. It should be pointed out that Rosso knew the Orsini Count of Anguillara during his Roman stay when it would seem he did the series of St. Roch drawings for him (D.13, D.14, D.15). Rosso’s portrait in Liverpool may be of this Count (P.16). Through him contacts with his relatives elsewhere would have been possible. 1Molajoli, 1958, 39, no. 112. 2 See G. Bertini, IV Mostra di Restauri, exh. cat., Naples, 1960, no. 16, Pls. 70 and 71. 3 On the interest in Byzantine art in Venice, see Rona Goffen, “Icon and Vision: Giovanni Bellini’s Half-Length Madonnas,” A.B., LVII, 4, Dec., 1975, 487-488. 4 See the many Venetian paintings with Turkish carpets in Mills, 1983. 5 The suggestion by Shearman in 1963 that Rosso’s portrait was influential on Bronzino’s Ugolino Martelli and Smyth’s thought that it is a rather remote ancestor of Bronzino’s Man with a Lute may rather reflect the common Venetian sources of all these portraits. Smyth, 1971, 80-83, actually does point out the independent sources of Bronzino’s portraits in Venetian portraiture. This is seconded by Iris Cheney in her review of Smyth’s book, Master Drawings, XI, 2, 1973, 169-170. It, does, of course, have to be acknowledged that Venetian sources could also have reached Rosso in Florence. They could have been available to him in Rome where Costamagna and Franklin thought Rosso’s Naples portrait was painted. But from the evidence within Rosso’s own oeuvre – the Mars and Venus specifically – a Venetian date still seems most reasonable to me.